Detail of the rock garden in Ruth Asawa's 'Garden of Remembrance' at UCSF. All photos by Andrew Alden. Stone is more than the peculiar specialty of geologists. All of us have dealt with stone since our deepest ancestors’ days in the African savanna, and I welcome the variety of viewpoints that center around it. The child, the builder, the fabricator, the gravestone cutter and the artist see stone in special ways. Lately I’ve noticed the affinity for stone that Ruth Asawa displays in her art. Ruth Asawa has created public art in the Bay Area and elsewhere for more than 40 years. Unlike her signature woven wire pieces, Asawa’s public commissions are in bronze or stone. The bronze is carefully sculpted and cast, but the stone is as nearly natural as can be. Let’s look at two interesting examples in San Francisco. 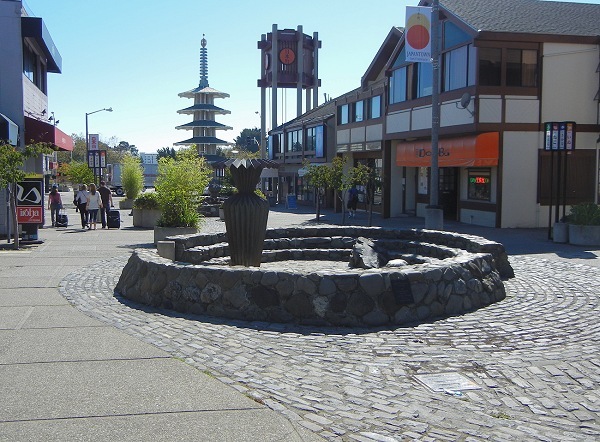 The Buchanan Mall (Nihonmachi) Fountain is an installation meant for use and enjoyment as an integral part of the Japantown center. It immediately calls to mind the traditional Japanese rock garden in the streamlines of its cobblestone pavers and island stones. Bronze sculptures, one of them a fountain, sit in two stone circles like islands or ponds. Both were inspired by origami. 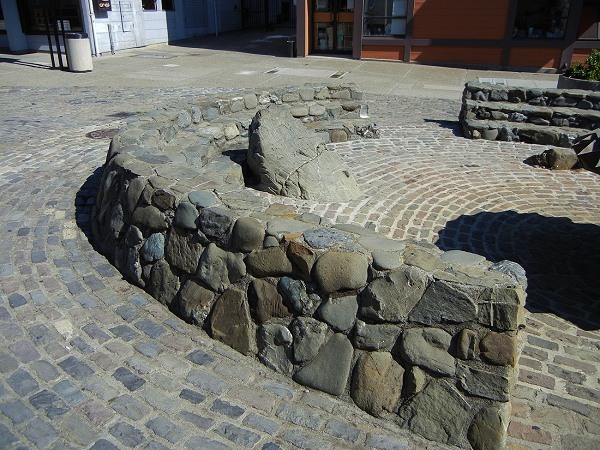 Both circles include island stones and are harmoniously faced with Californian river rocks. It interests me that Japan and California, facing each other across the Pacific, both owe their geology to subduction, the plate tectonic process of clashing plates that pushes their rocks together into mountains. 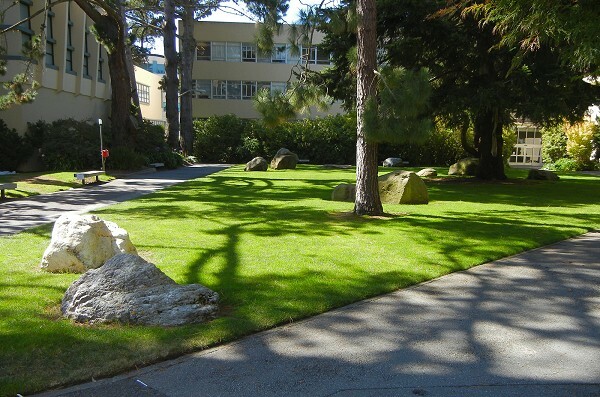 The Garden of Remembrance is in a courtyard at San Francisco State University, built to commemorate the imprisonment of Japanese-Americans during World War IIa troubling act of U.S. public policy and a formative event in Asawa’s life. 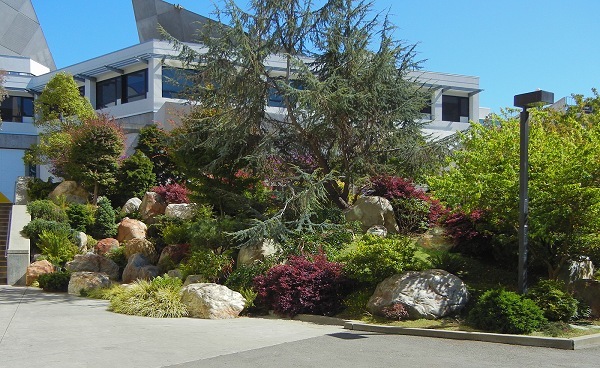 It has two parts, a grassy square and a waterfall rock garden. 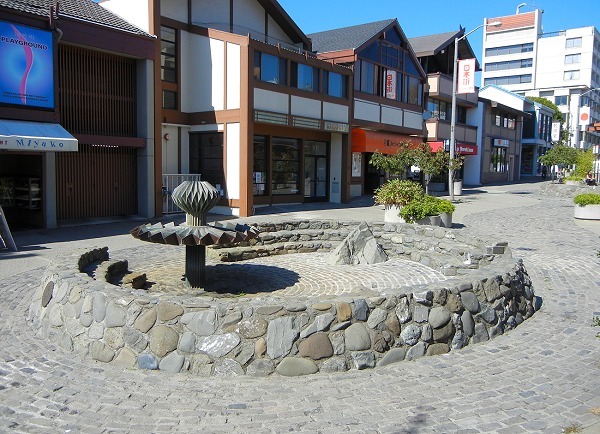 Apparently Asawa’s intent for the square was to bring together rocks from each of the ten War Relocation Centers. But the first stone I approached told me immediately that geology had thwarted this purpose. This classic peridotite, streaked blue with serpentine minerals, could not have come from California’s Tule Lake or Manzanar. The first would have been black Cascades lava, the second Sierran granite or gneiss. 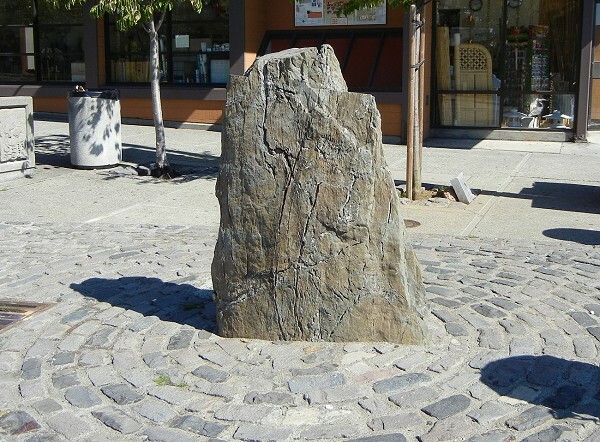 This boulder comes from the Klamath Range. Clearly these stones were symbolic, not literal representatives of the camps. It was a relief at that point to put down my geologist’s mindset, because an artwork like this should not distract anyone from its true purpose. Later I learned that the Rohwer, Arkansas, camp where Asawa spent the war years (along with George Takei, Janice Mirikitani and more than 8,000 other American citizens) was located in a marshy lowland with no rocks at all. The same was true of the camp at Jerome, Arkansas. While there is some color among the ten boulders, most are structureless mudstones, dark and mute. They populate their lawn in a scatter that schematically matches their pattern on the American map. 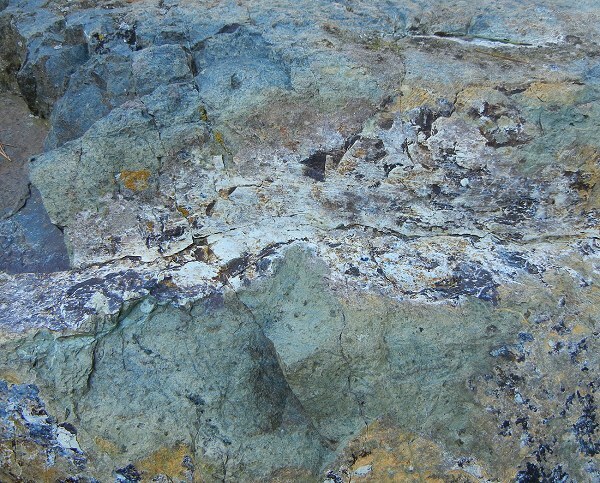 (In that context, the blue peridotite represents Tule Lake and its exceptional role in the camp system. Maybe my geologist’s mind has something to work on after all.) Asawa collaborated with stonesetters Isao Ogura and Shigeru Namba in selecting and placing the stones here, and in the uplifting rock garden next to the lawn. 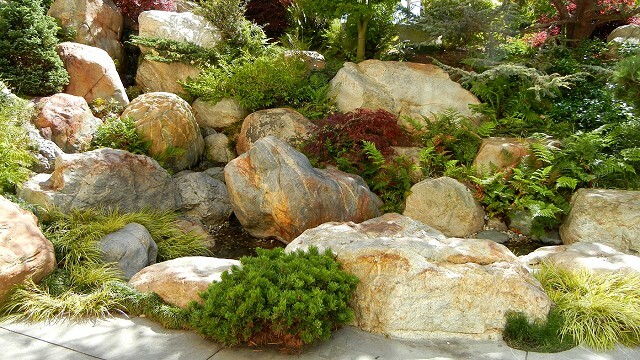 Even at shady times of day or in the typical fog, this garden must be a bright place thanks to the light-colored Sierran boulders. On a sunny day, the combined direct and reflected light makes it almost dazzling. The top photo of this post shows a closeup. The stones themselves are luscious, coaxing even the geologist to simply stand and gaze. Another fantastic post! Geology-Art-and back around. Thank you Andrew!